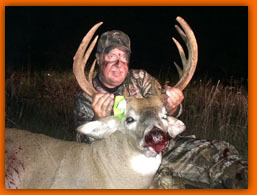 The Bow Condo came through again this year, Here is a photo of the 6.5 yr old 9pt buck dressed weight of 230 pounds. I had set up several times around the field edge to hunt two big bucks that I had seen just once in the past month. I had several bucks that I let go including a 150 class 10pt. I noticed that the deer would end up close to the bow condo that was set up in middle of the field in a tree island adjoining clover and corn. My best option was hunt out of the Bow condo and get in close.This buck and another buck never knew I was there, and I shot him at 25ft. I could not have had the opportunity without the Bow Condo. Keep up the great work. I can’t wait to try the crossbow Condo.